Achieving What's Most Important Means Working Smart, Not Hard! Anyone can work longer hours doing the same thing. Learn to focus your energy on your most important goals by using our process to get them achieved! ﻿After working with more than 400 coaching clients worldwide and seeing the effects of some consistent work behavior patterns, I created a process for lazer focusing your purpose, your time and your energy so you can achieve what is most important to you. 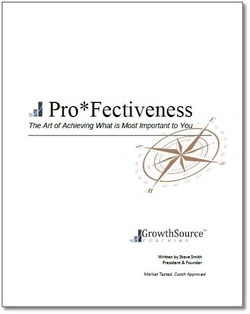 Pro*Fectiveness is a personal development 'Playbook' that will not only expose you to making yourself more effective at achieivng your highest priority goals but guides you through a process for creating your own Pro*Fectiveness plan. Best of all, it's FREE! Just sign up and download your copy today. Achieving What's Most Important Requires Doing Things Very Differently! If you are working long and hard but don't feel like it's adding up to much, you need to change your mindset, routine and ability to stay in the game. Pro*Fectiveness shows you how to change your focus and your better use your most important resource so you become a goal achieving machine! It's not a matter working harder, it's a matter of working smarter and with greater purpose. It's not a matter of working longer, it's the ability to focus your time on your highest priorities. It's not about working yourself into the ground, it's about keeping yourself in a state of peak performance. If your efforts mean more to you than showing up and fulfilling a list of activities that don't lead to what you are truly passionate about, help is here! Get your free copy of Pro*Fectiveness: The Art of Achieving What's Most Important to You today and start living your dream!